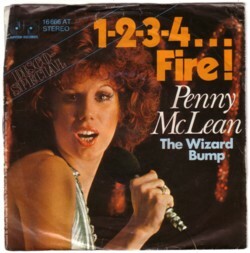 Among the many records that I treasure for reasons that are difficult to explain to my friends, are two 45’s by Penny McLean. They are from the mid seventies, and I bought them when they came out. These 45’s should be filed under Bump , which was a popular dance in the disco scene of the seventies. I have never seen a Bump compilation, by the way, and I think I will try and make one myself. The dance may look stupid (although I quite liked it back then), but it resulted in some great disco hits. 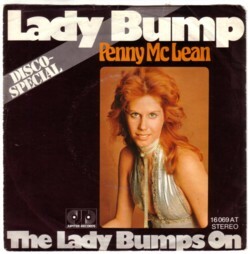 Like Joe Tex’ Ain’t gonna bump no more with no big fat woman , and Lady Bump by Penny McLean. I thought that Penny McLean was a one-hit wonder, but I just disgoogled that she was also in the band Silver Convention. I should have known, because on my shelf of records-that-my-best-friends-consider-silly are also at least five 45’s by Silver Convention. And after her music career Penny McLean, whose real name is Gertrude Wirschinger, became a succesful author of esoteric books. I have never read any of these books, but they are now on my want list.